Background: Advanced Glycation End products (AGEs) are basically the end result of glycation of proteins and/or lipids in the presence of sugars. Specific cases of hyperglycemia have been reported with increased propensity of generation of AGEs. Many chronic and deadly diseases such as diabetes, cancer and neurodegenerative disorders have been known to be caused as a result of generation of AGEs. The role of glutathione (GSH) metabolism and its intricate association with AGEs have also been well established in breast cancer prognosis and treatment. To understand the etiology, mechanism and production of AGEs along with clinical relevance of Receptors for Advanced Glycation End-products (RAGE) and RAGE ligands, their interplay with GSH is of paramount importance especially in relation to breast cancer. Methods: The available literature using PubMed, National Library of Medicine database, Web of Science and SCOPUS indexed, Science Direct and other prestigious journals have been systematically reviewed using the keywords: advanced glycation end-products, breast cancer, glutathione RAGE, and AGEs inhibitors. This narrative review of all the relevant papers with significant citations has led us to have greater insight into the action mechanism and potential therapeutic significance of AGEs inhibitors. Results: Targeting breast cancer with the specific immunoglobulins and with other therapeutic interventions is needed to inhibit the generation of AGEs and manage glutathione expression, thus having strong implications in the management of breast cancer. Many RAGE ligands such as HMGB1, S100P, S100A8, S100A9 etc. have been known to enhance RAGE expression which may further lead to increased proliferation, migration and metastatic nature of tumor cells. Hence, RAGE and RAGE ligands in a close linkup with GSH may prove to be effective therapeutic markers of severity of breast cancer and for angiogenesis of tumor. 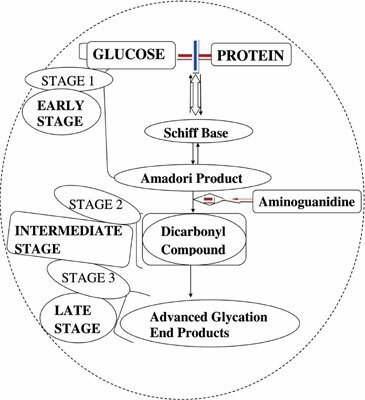 Conclusion: This review provides a strong platform to comprehend the etiology, mechanism and production of AGEs and glutathione along with the agents which can block their production, paving a way for the therapeutic intervention and an amicable solution to treat and manage breast cancer. AGEs (Advanced Glycation End Products), breast cancer, glutathione, ligands, RAGE, therapeutic intervention.